The body can heal itself. You just need to line up the right principles. I don't see much point in putting together a personal health programme that is not something that you, the client, will adapt and implement. Most of the time, we need to make changes to our dietary habits, breathing, exercise routine, or lifestyle habits....so let's make those changes gradual and step-by-step so that they become a PART OF your lifestyle and not something that you do just as a fad for a limited time. Most of all, it MUST be achievable for YOU! Diets often don't work because they are too drastic, too extreme, or different from your "normal" routine and eating habits. Long-lasting, health-promoting changes to your habits are unique to YOU. You are the best one to experiment with what works best for your body and how those changes and new habits can provide you with long term vitality and wellness. Choose a Personal Health Programme designed to suit your unique health goals, desires, and current challenges. Using a thorough case history along with an Iridology photograph, I tailor a personal health programme to best suit those goals, needs, and desires. Herbs, Supplements, Naturopathic treatments, and Dietary recommendations will be given during cleansing programmes to guide you through detoxifying specific body systems and organs. It is a personal choice should you decide to do a cleansing programme whilst having colonics. It is not a prerequisite but highly encouraged. I will be running cleanse courses twice a year (probably in May and October, at the change of seasons) in small groups. I will also coordinate guided Liver/Gall Bladder flushes and Kidney Cleanses, also in small intimate groups or one-on-one. My aim is to assist those who would not otherwise feel confident and/or inspired to do a cleanse. This is an extremely effective way to kick-start the body and is very beneficial in preventative health. It's also a great health tune-up. Check out the video on this page. "Every drug you use will leave residues of some kind in your body even after you quit taking it. While you are using prescription and/or over-the-counter remedies, these drugs will mix with the chemical food additives you take in when you eat processed foods, together with the bile salts, pancreatic enzymes, putrefying proteins, alcohol (if you drink), the metabolic by-products of bowel bacteria, and whatever else is there. The bowel, lymph, bloodstream, and liver can become a kind of catchall system, not necessarily able to to detoxify or excrete all the chemically harmful substances that interact with one another as well as with the body chemistry. Often, toxic substances are stored in body fat, genetically weak organs and tissues, and the bones. Tissue cleansing to get rid of all this repugnant debris is one of the BEST approaches to developing a healthier body." PREVENTION OVER CURE IS KEY! It is always easier to prevent a disease or imbalance from manifesting in our bodies than to try to cure it once it has already set in. It is important to look at how we can live our lives to avoid health problems from occurring. We often take better care of our cars and animals than we do of ourselves. Here in New Zealand, we are required to have a warrant of fitness done every 6 months on our vehicles as a rigorous safety and efficiency test. Imagine if we did the same thing for our bodies! Thrive Therapies' Health Programmes are a body warrant of fitness. Imagine how many diseases we would be able to prevent from turning chronic if we sorted them out with nature-cure principles before they had the chance to settle in! Why not keep our bodies functioning efficiently - our engines running smoothly - so that we can enjoy good health? It is certainly easier (and less expensive!) to change the oil in your vehicle than get a whole new engine! This is "prevention over cure." Make Sense? We open the last stage of toxin removal first (the large intestine) to facilitate the other organs to remove their toxins. Like growing a garden we must remove the weeds, rocks, sticks etc. before we plant the new seeds. We till the soil and add nutrients to create a healthy rich environment in which the new plants can grow. This analogy emphasizes why Colon Hydrotherapy and Naturopathy are so important. We must open all the body's 'EXITS' so that rubbish and toxins can be removed. First we open the exits (through the bowels, skin, urinary tract, and respiration) and then we work on cleaning the filters (liver, kidneys, and lymph). Especially in today's toxic world, we must open all exits and clean the filters before we can plant new seeds and have a healthy flourishing internal environment. It's important to remember to BREATHE and RELAX during any cleansing programme (the major organs need to contract and/or spasm in order to release toxicities). Again, BREATHE, RELAX, and GO WITH THE FLOW! Disclaimer: Thrive Therapies' services are not intended to replace the relationship you have with your primary health care provider, and we do not give medical advice. It is important to always consult with your doctor if you have concerns prior to making changes in your current health care regimen. 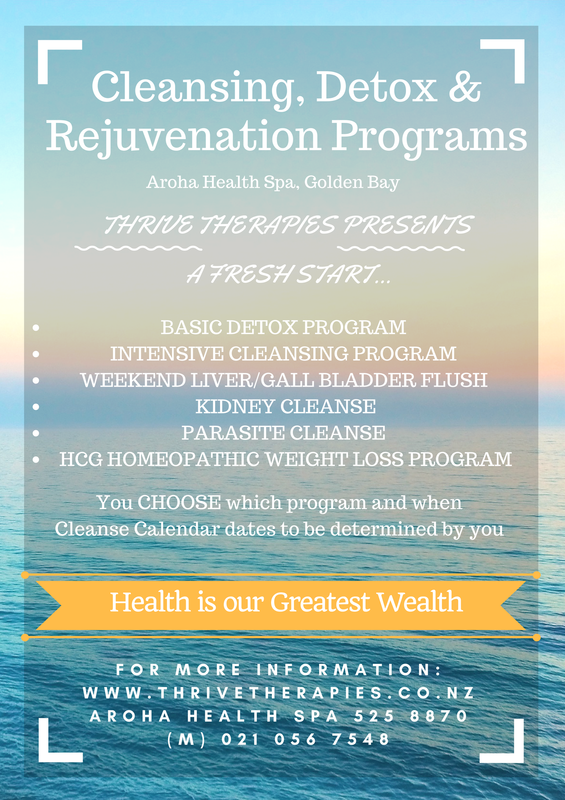 We encourage you to be open to new information on the effectiveness of Colon Hydrotherapy, as well as the critical role diet, exercise, stress management and positive surroundings play in your overall health and wellness. The information and services provided at Thrive Therapies is not used to prescribe, recommend, diagnose, treat or cure a health problem or a disease. We are not a substitute for medical care and Shanti Smith is not a Medical Doctor. If you have or suspect you may have a health problem, you should consult with your primary health care provider.